Those clever guys at UCL's Centre for Advanced Spatial Analysis have put together a dashboard of data feeds showing the current health of London. 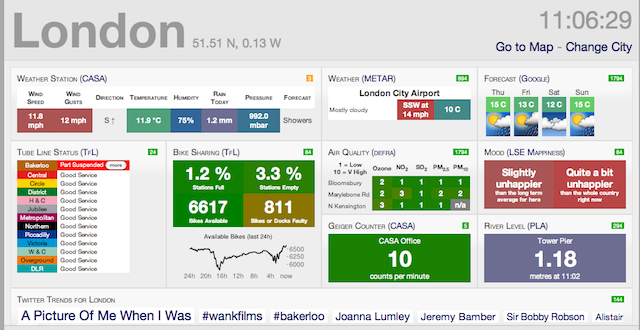 The main dashboard shows obvious stuff, like weather information and Tube status. But they've also slipped in a few peculiar feeds, such as a Geiger counter reading of radiation levels and a measure of how happy the city is, via the Mappiness app from London School of Economics. There's also a feed of trending Twitter topics for London which, at the time of writing, include Joanna Lumley, #wankfilms and #bakerloo. 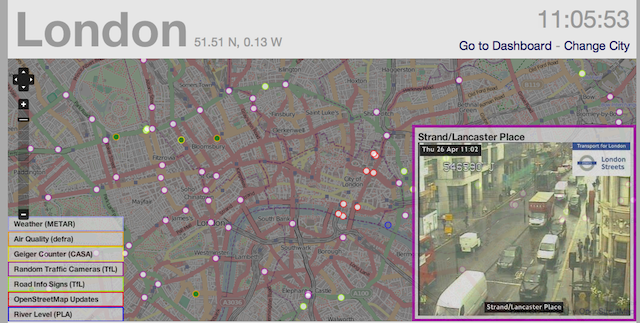 Click the map tab and you get plenty more, including traffic cameras and air quality reports. The City Dashboard is also available for Birmingham, Cardiff, Edinburgh, Glasgow, Leeds, Manchester and Newcastle.